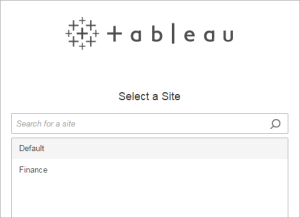 To access content on Tableau Server or Tableau Online, sign in via Tableau Desktop or a web browser. Note: If you sign in via a web browser, it must be configured to allow first-party cookies. 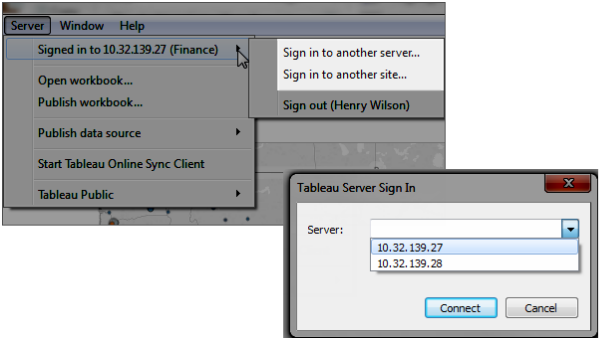 In Tableau Desktop, select Server > Sign In. 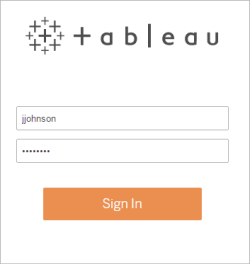 Enter the name or address of your Tableau server, and then click Connect. Enter your user name and password, and then click Sign In. If you have access to multiple sites, select the one you want to use. You can also enter the name of the site and search for it. 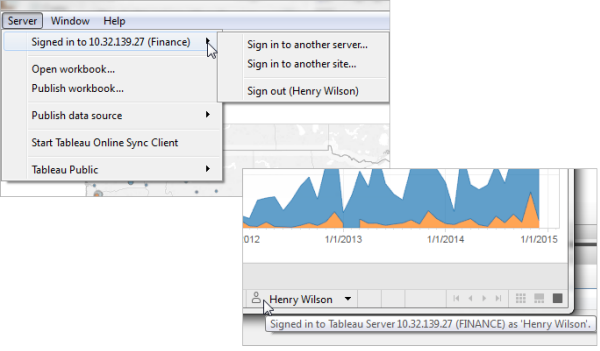 In Tableau Desktop, select Server > Sign In. Click Tableau Online in the bottom left corner. Enter your user name and password, and then click Sign In. If you have access to multiple sites, select the one you want to use. When you connect to Tableau Server or Tableau Online, Tableau Desktop keeps you signed in from session to session, if you don't sign out. Next time you launch Tableau Desktop, you are automatically signed in to your most recent server connection. You can easily switch to other available server and site connections. The Server menu shows the server and site that you are signed in to. Sign out shows you are signed in as. The status bar also provides this information. Hover over the username to see the current server and site. To switch servers, on the Server menu, click Sign in to another server, and then enter the server name and your sign-in credentials. If you have access to multiple sites, on the Server menu, click Sign in to another site. When you sign in to a server and site, Tableau Desktop stores your credentials in a secure token that remembers your connection. After this token is in place, you can access the server directly, without having to sign in. Click Server > Sign out to clear your sign-in credentials for the current connection. To remove all of your existing server connections, click Help > Settings and performance > Clear saved server sign-ins. If you never want server sign-ins to be saved, a Tableau Server administrator can change the server settings to disallow connected clients. Be aware that this setting also affects other Tableau clients like Tableau Mobile. For more information, see Authentication for Connected Devices in the Tableau Server Help. On the Server menu, select Switch User. In the Tableau Server Sign In dialog box, provide the new user name and password. 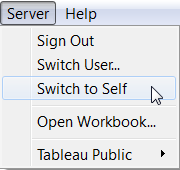 To later sign in using your normal credentials, select Server > Switch to Self. If you are signed in to the wrong account, you can switch to another one. Click Sign Out on the user menu in the upper-right corner of the page. 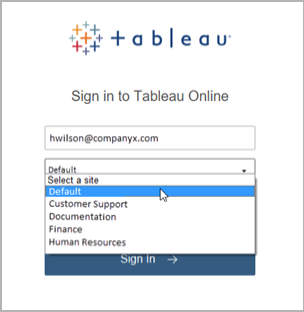 Note: If you do not see a Sign Out command on the Tableau Server user menu, you must use the sign-out interface provided by your organization's external identity provider (IdP). For more information, contact your administrator. If you are a member of multiple sites, you're prompted to select one when you sign in to the server. Either click a visible site name or search for a name to select from a list of matching sites. The name of the current site is displayed on the site menu.